The Helios packs an impressive amount of performance, but the ultrabook's familiar design can't mask its average battery life and lacklustre trackpad. Featuring a slim-and-light design, silver aluminium unibody casing and black chiclet-style keyboard, there's no prizes for guessing who Chillblast is trying to appeal to with its 14-inch Helios ultrabook. All that's missing is a black fruity logo. At £700 (around US$1,098, or AUS$1,501) it's around £150 (around $253 or AUS$321) cheaper than Apple's entry-level 13-inch MacBook Air while offering a higher-resolution display and a faster Intel Core-i5 processor. It's around a third cheaper than Dell's entry-level XPS 13, which packs an impressive practically borderless Infinity Display, but it's slightly more expensive than Asus's impressive Core M-powered ZenBook UX305. 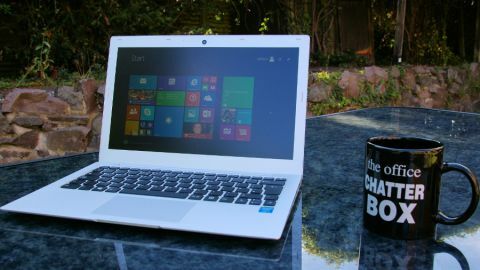 Windows ultrabooks that ape the MacBook Air's design usually fall into two camps: those that do so subtly and others that don't try to hide it. The Helios falls in the latter, and just like the Air you'll either find its minimal style bland or elegant depending on your taste. There's an indent at the front of the base unit which makes it easier to raise the lid, but we noticed that the lid's rim can feel quite sharp to the touch as there is a slight overlap on the display. In all other respects, both the casing and the hinge feel sturdy and secure – there's no noticeable flex during handling. The keyboard is the familiar black tile chiclet style where the keys are well spaced and firm but this does mean you have to hit them squarely in the middle to avoid missing letters out. Like the Asus UX305, none of the keys are backlit so you will be literally typing in the dark. Chillblast's decision to position the Delete key next to the power button, and the Function key next to Enter, also make the chance of typing errors more likely. The touchpad is large and like the keys has to be touched firmly for maximum response – altering the sensitivity settings does produce some improvement but too much compensation can allow the cursor to fly to random areas of the screen when typing. As for connectivity, the Chillblast Helios comes with a single USB 3.0 and one USB 2.0 port (compared to the Dell XPS 13's dual USB 3.0 ports) and a 2-in-1 card reader (SD/MMC) as opposed to the 3-in-1 for the Dell machine. However, this machine scores over its rival by including Ethernet and HDMI out.